Police Headquarters, Mizoram is situated at the heart of the capital City at Khatla, Aizawl, Mizoram. ADDRESS : Police Headquarters, Khatla, Aizawl, Mizoram. Pin Code – 796001. Police Department, Mizoram is headed by the Director General of Police (DGP) assisted by various senior officers like IGP(M), IGP (Intel. and L&O), DIG(HQ), DIG(TRG), DIG(NR), AIG-I, AIG-II, AIG-III, AIG-TRG, AIG-Legal and AIG-Modernisation. 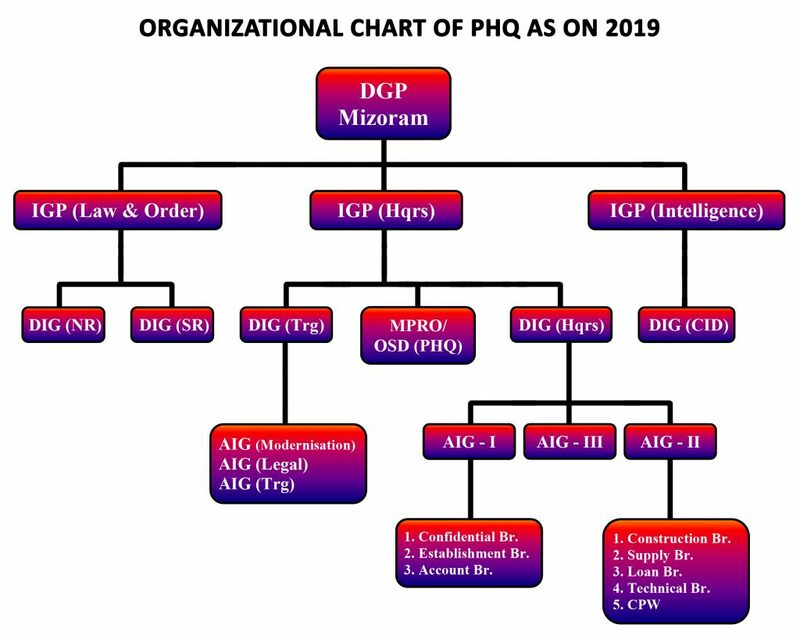 Various branches and functionaries at PHQ are shown in the Organisation Chart of PHQ. The current DGP of Mizoram is Shri Balaji Srivastava IPS. The Mizo District Council, one of the administrative unit under the State of Assam got status of Union Territory on 21st January, 1972. Until Mizoram became Union Territory, the then Superintendent of Lushai Hills was the head of Police Force assisted by one Dy.SP. The first and foremost Superintendent of Police was posted in 1960. A small CID cell was also functioned under the control of Dy.SP at that time. Shri I.J. Verma IPS was posted as the first I.G.P of Union Territory, Mizoram (20.01.1972 – 27.09.1974). During that time S.P, PHQ who was in-charge MPRO/ FSL, S.P Aizawl, S.P Lunglei, Dy.SP in-charge Chhimtuipui District (now Siaha and Lawngtlai District) and S.P, CID (SB) had also functioned. Shri G.S. Arya IPS was posted as IGP, Mizoram vice Shri I.J. Verma IPS in 1974. In 1975 two other IPS officers were also posted in Mizoram. Shri L.B. Sewa IPS took the charge of DIG, Mizoram w.e.f. 01.01.1975 and Shri K. Panchapagesan IPS was the S.P, CID (SB) w.e.f. 10.01.1975. * Special Narcotic Police Station, Cyber Crime Police Station and Traffic Police Station are also functioned as full-fledged Police Station in addition to above cited P.S.